The Dunluce Castle was built in one of the most incredible locations we could imagine for a castle. One of our favorite parts of visiting Ireland was getting to see all of the amazing old buildings, cathedrals, and castles. Especially the amazing old castles. On top of being some of the most incredibly beautiful buildings, the history behind these castles is really neat to learn about. We just could not get enough of the castles. One of the more amazing castles that we got to see in Ireland was the Dunluce Castle in Northern Ireland. The castle itself has seen better days, as you can see by the pictures, but the location where the castle was built is absolutely breathtaking. Talk about your prime real-estate. The original Castle was built in the 13th Century by Richard Óg de Burgh, the second Earl of Ulster. The castle was in the hands of the McQuillan family for much of the 13th century until they were defeated in two major battles by the MacDonnell clan in the late 16th century. Dunluce Castle served as the seat for the Earl of Antrim until after the Battle of the Boyne in 1690, when the MacDonnell family became impoverished. In the last three centuries the castle has deteriorated, with parts used for other nearby buildings, to its present day condition. If you visit, make sure you check out the viewpoint we outlined in this guide for some great picture opportunities. While it was a really fantastic experience to be able to get up close to the castle, some of the best pictures we got of the castle were from a viewpoint nearby. It was from this viewpoint that I took the picture above. In case you are interested, I have included a screen shot of the map of my shots I pulled from Adobe Lightroom. This will let you know exactly where I got my shots. There is a viewpoint not far away that gives you a fantastic view of the castle for some pictures. We would definitely recommend visiting the Dunluce Castle on any trip to the north coast of Northern Ireland. It is not every day that you get to see a castle built in such a unique and beautiful landscape. It’s a shame that the castle has deteriorated so much, but in some ways its condition only adds to the beauty and mystique of this amazing fortress. The Dunluce Castle’s close proximity to the Giant’s Causeway and the Carrick-a-Rede Bridge make this area a great stop during any visit to Northern Ireland. It is such a beautiful area with so much to see. Not to mention, the people in Northern Ireland could not be any friendlier. Getting to the castle is pretty easy. 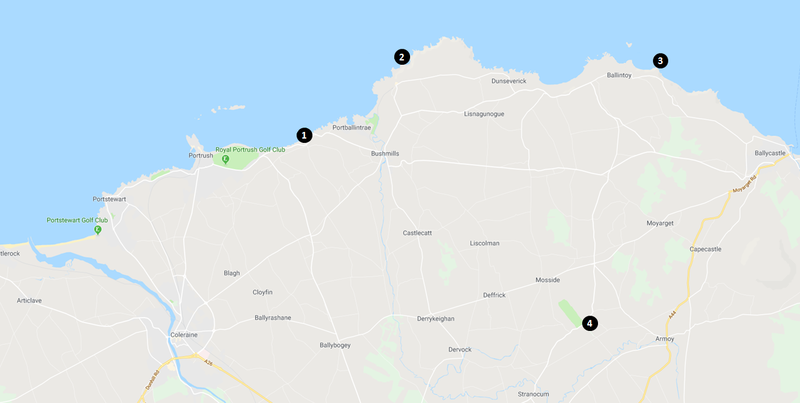 Dunluce Castle is located on the north coast of Northern Ireland and is situation roughly halfway in between the town of Portrush (3.5 miles away) and the Giant’s Causeway (4.4 miles away). The closest town to the Dunluce Castle is Bushmills, which sits just 2.5 miles to the East. It’s a great place to stop for food in between exploring. The Dunluce Castle is located in very close proximity to the Carrick-a-Rede Bridge and the Giant’s Causeway. Coastline near the Dunluce Castle in Northern Ireland. The Dunluce Castle in Northern Ireland. 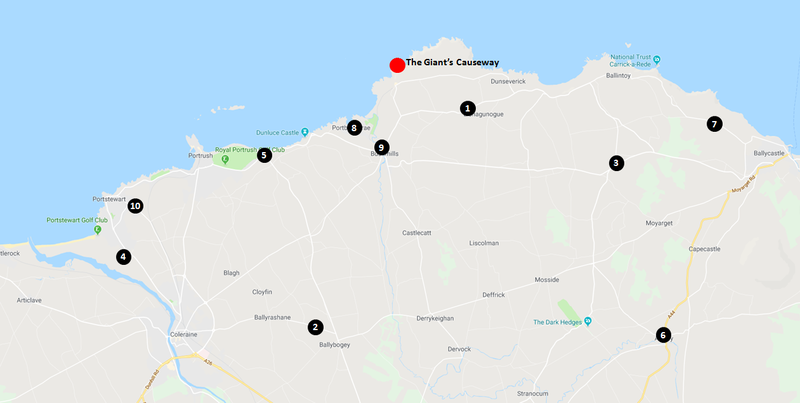 In addition to the Dunluce Castle, there are a number of other popular tourist attractions in the area that you can see. If you are looking for some additional things to do, I have included a list of additional stops that I recommend below. In case you would like a better sense of what it is like to visit the Dunluce Castle, we have included a short video tour for you below. You can see first-hand just how beautiful the castle is perched up on the high cliffs. Below is a gallery of some of the beautiful pictures we were able to take of the Dunluce Castle. It really is a fantastic landscape for pictures and an incredible location for a castle. Great article. I hope to get to Ireland one day. Thank you Jeni! It is definitely a beautiful area! I am so happy to hear you found the info useful! Thank you so much for the kind words. You are going to love Northern Ireland! Indeed our visit was amazing too. What an awesome location for a castle! Will have to visit soon!